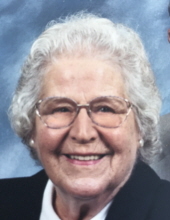 Elizabeth “Betty” Baltz Frey, a resident of Wesley Enhanced Living, Doylestown and a former long time resident of Hatboro, died Friday, June 15, 2018. She was 95. She was the wife of the late John Frey, with whom she had shared 58 years of marriage. Betty was a member of the Frankford High School class of 1941. She enjoyed crafts, bowling, collecting coins, old cars and travels to Lake Louise, Bampff, and the Grand Canyon to name a few. She was a Girl Scout leader and volunteer with Meals on Wheels. She loved surf fishing with John. She is survived by her daughter, Judy Mills; her son Jack Frey (Lecia); six grandchildren; fourteen great grandchildren; her sister Marjorie Clark and many nieces and nephews. Her family will greet relatives and friends from 7 to 9 pm, Thursday, June 21 in the James R. Baskwill Funeral Home, 20 W. Montgomery Ave (half block west of York Rd) Hatboro and again after 10 am Friday June 22 at Lehman United Methodist Church, 300 S. York Rd, Hatboro, PA 19040, where her funeral service will begin at 11 am. Her interment will follow in Oakland Cemetery. To share a memories or photos of Elizabeth Frey, please visit the funeral home web site listed below. To send flowers or a remembrance gift to the family of Elizabeth B. Frey, please visit our Tribute Store. The family will greet relatives and friends again after 10 AM, Friday in Lehman United Methodist Church. "Email Address" would like to share the life celebration of Elizabeth B. Frey. Click on the "link" to go to share a favorite memory or leave a condolence message for the family.